The two mega hydroelectic power plants, fueled by the Jipau and Santo Antonio dams on the Madeira River are to be completed by 2015, despite local opposition violation of human rights. In Jan 2016, Nilce de Souza Magalhães of MAB was assassinated. Among the IIRSA projects approved in 2000- Initiative for the Integration of South American Regional Infrastructure -, there was the construction of two dams on the Madeira River, the biggest tributary of the Amazon River. The communities of Jirau and Santo Antonio, where the dams would be built, launched the Viva Rio Madeira Vivo campaign and oppose the megaprojects that would flood their territories and destroy the areas ecosystem. According to International Rivers Network, the Madeira River is the Amazons largest and most important tributary. Spanning about a quarter of the Brazilian Amazon, the Madeira Basin is a treasure trove of biodiversity, providing home to the spotted jaguar, giant otter, pink dolphin, and countless other endangered mammal species. The river teems with life – an estimated 750 fish species migrate some 4,500 km each year to spawn and feed in the nutrient-rich, muddy waters of the upper Madeira. But all this is under threat. The Brazilian government is building two massive hydroelectric dams on the Madeira. 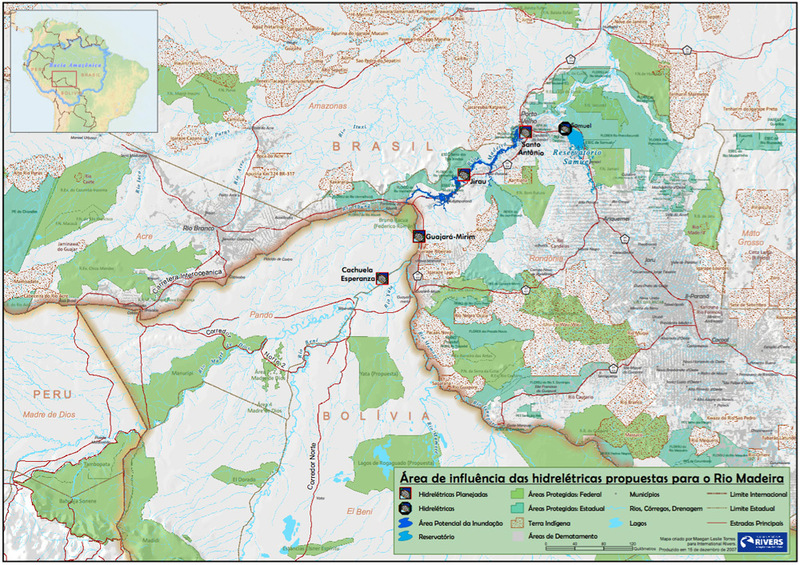 Construction of these projects–plus two additional dams upstream–would transform the Madeira into an industrial shipping canal, providing the power and transport needed to move large quantities of resources out of the Amazon—and accelerate its destruction. The project is the largest of the IIRSA. The projects have been marked by labor rights violations, and have already begun to block the transport of sediment and the passage of fish and threaten the river’s unique biodiversity, affecting the land and livelihoods of thousands of river bank dwellers and indigenous people. The numerous indigenous tribes living on the Madeira banks have not formally been consulted before the start of the construction and so have not given their prior consent (as stipulated by the Convention 169 ILO). 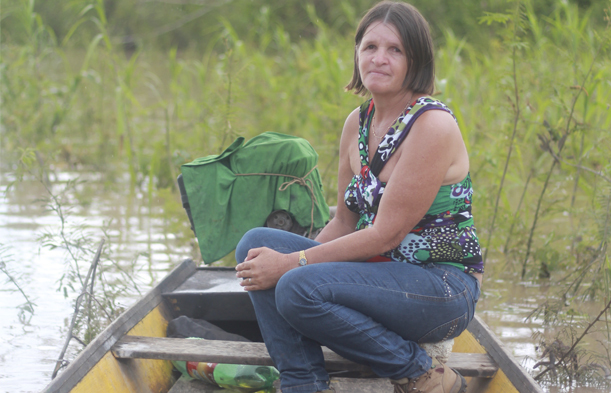 Update June 2016 (in Portuguese): Nesta terça-feira (21), o corpo de Nilce de Souza Magalhães, mais conhecida como Nicinha, foi encontrado no lago da barragem da Usina Hidrelétrica Jirau, em Porto Velho (RO). A liderança do Movimento dos Atingidos por Barragens (MAB) havia sido assassinada no início do ano e seu corpo estava desaparecido desde o dia 7 de janeiro. Project Details Santo Antonio Dam: The dam itself will be 13.9 m (46 ft) tall and 3,100 m (10,171 ft) long, creating a reservoir with a surface area of 271 km2 (105 sq mi) (164 km2 (63 sq mi) of which is the existing river channel). The dams power plant is divided into four sets of Kaplane-bulb turbines for a total of 44, each at 71.6 MW, for a total installed capacity of 3,150.4 MW. Jirau Dam: The length of the entire dam will be 1,100 m (3,609 ft) while the embankment section will be 800 m (2,625 ft). The embankment dam will be arched, 63 m (207 ft) tall and will have an asphalt-core. Its structural volume will be 2,000,000 m3 (70,629,333 cu ft) of which 17,000 m3 (600,349 cu ft) will be asphalt. The dams spillway will consist of 21 gates and will have a maximum discharge of 82,000 m3/s (2,895,803 cu ft/s). 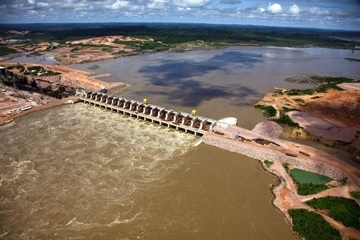 The Santo Antonio dam power station will have a generating capacity of 3,150 MW and Jirau dam power station a capacity of 3,750 MW, both costing in total nearly US$15 billion. Why? Explain briefly. Despite the protests, the construction of the dams is underway, it started commercial operations by 2012 and construction is expected to be over by 2015. Escritos sobre o agua, Forum Carajas, 2003. Las Venas del ALCA: Integracion de la Infraestructura Regional de Sudamrica, IIRSA. Bolivia, un pas de transito y de extraccin de recursos, Fobomade, 2003. Otro paso en la explotacin de los pueblos y territorios Sudamericanos, Friends of the Earth, 2003. The El Norte Amazonico de Bolivia y el Complejo del rio Madera. Fobomade, 2007.